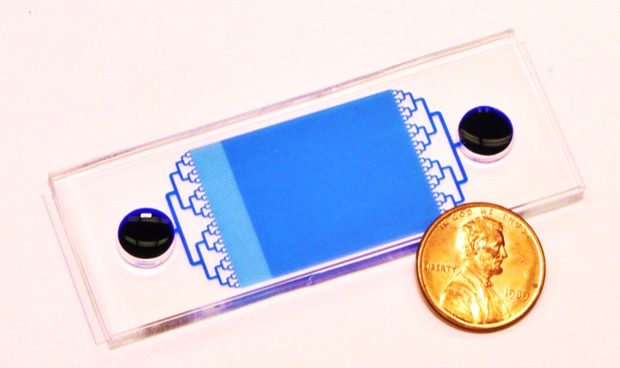 A new device for studying tumor cells can trap 10,000 individual cells in a single chip. The technique, developed at the University of Michigan, could one day help screen potential cancer treatments based on an individual patient's tumor and help researchers better understand so-called cancer stem cells. It also sheds light on a controversy: are large cells or small cells more likely to be cancer stem cells? Cancer cells are not all the same, and one theory holds that no more than 5 percent of the cells in a tumor are cancer stem cells. These few may be the only cells capable of causing a relapse or metastasis. "Most normal cells will die if they are not anchored to something, but cancer stem cells can survive. They can become circulating tumor cells and come to another area of the body," said Euisik Yoon, professor of electrical engineering and computer science, and biomedical engineering. The team led by Yoon designed and made a device that takes advantage of this ability in hopes of understanding cancer stem cells better: how to identify them, what causes them to grow or die, and how to target them with cancer treatments. Their chip contains up to 12,800 wells for catching individual cancer cells. The team tested the chip with breast cancer cells, donated by researchers in the U-M Comprehensive Cancer Center. They mixed the cells into a solution and ran the liquid through tiny channels in a plastic chip. Each channel was lined with chambers for trapping single cells. The chambers have small openings to a parallel channel, which creates a draft that draws cells in—sort of like the drain in a sink. Once a cell is trapped, it blocks that opening and stops the draft. This ensures that, most of the time, only one cell is pulled into each chamber. The walls of the chamber are coated so that the cell can't latch on. As a result, normal cells that can't cause metastases die over the course of a few days, leaving behind just the cancer stem cells. These cells reproduce in their chambers, forming tiny floating colonies, or tumorspheres. While the ability to isolate 10,000 individual cells is impressive, it wouldn't be useful if the team had to manually record every one, as required by most devices that capture cancer cells. The key is their computer algorithm, capable of combing through the microscope images and assessing the size and number of cells in each well. The algorithm's particular talent is identifying cells no matter whether they show up dimly or brightly in the microscope image. "Our method is special because we really want to enable the study of many cells at once," said Yu-Heng Cheng, a doctoral student in electrical engineering and computer science. "Cancer cells have many different appearances, and our algorithm recognizes them." The team tested cancer cells that originated from four different women, measuring the cells immediately, after one week and after the second week. The computer program tracked which cells grew into spheres and which self-destructed. The team then looked for the answer to the puzzle of what size cell is most likely to be a stem cell. They compared the proportion of cells that went on to form tumorspheres, setting the smallest 30 percent of trapped single cells against the largest 30 percent. Like most answers in cancer, it wasn't simple. For one cell line, the small cells were twice as likely to grow, while the opposite was true for another. For the third, size didn't matter at all, and for the fourth, large cells were several times more likely to grow. But the team anticipates future studies to clarify the stem cell size question further. "With this tool, experiments will be faster and easier, so we could screen many, many cell lines and potentially resolve the controversy here," said Yu-Chih Chen, assistant research professor in electrical engineering and computer science and in the Comprehensive Cancer Center.